You don’t need much to cook tasty meals on the road. However, car camping provides a little more space than other types of camping, so you can get away with stashing some treats. Here are a few things I keep the back seat or a cooler to give those fireside meals an extra boost. Jarred jalepeño slices and/or hot sauce. These are first on the list because you can use them in almost every camp meal, morning, noon or night. 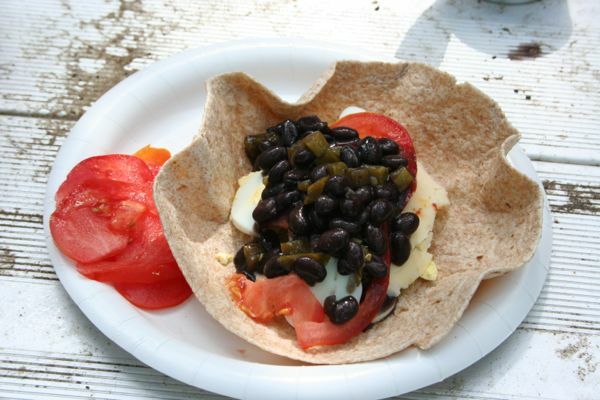 If you like a bit of a kick, add hot sauce or pepper slices to eggs, wraps, grains, veggies, sandwiches, etc. They will keep in the cooler for probably way longer than you need them too, and you can always bring leftovers home or gift them to fellow campers. Salt, pepper and olive oil. Spices are non-perishable, easy to store, and go a long way in flavoring dishes. If you are working with the same basic ingredients for a few days in a row, you will be surprised how exotic even just salt and pepper will taste. You can pick up a cheap non-breakable salt and pepper set at the grocery store, or pack spices from home in plastic straws that are bent and taped shut at the end. It is best to store everything so that you can pour directly on food and don’t have to use your fingers, since they will likely be dirty. Olive oil is an easy cooking medium/fat because it adds flavor, does not need to stay in the cooler, and can be used to cook almost everything. Try to find a plastic bottle since glass can break and is not allowed at some campsites. Tortillas. You can instantly turn a pile of left over ingredients into a dish-free breakfast, lunch or dinner with any kind of wrap. Plus, most of them do not require refrigeration. You can even toast them in an hot, non-greased skillet on the camp stove or over a fire for 1-2 minutes. A block of cheese. Need I explain? Chocolate. Chocolate is a lifesaver for a few reasons. Most importantly, depending on how long you are camping, you will likely become sick of all of your food and will just want a treat. Chocolate, in any form, will back you up in those moments. If it’s hot out or your food is being stored in the car all day, keep it in the cooler. Chocolate is also a great trail snack that provides some sugar to keep you going. Snickers are my favorite because they provide salt and fat in addition to calories, which is helpful if you are doing something particularly strenuous and sweating a lot. 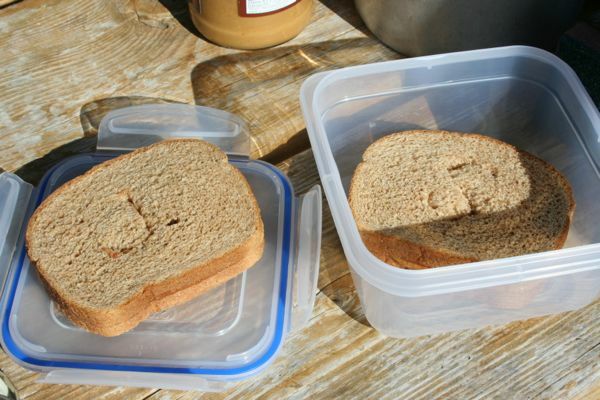 PB & J. Peanut butter and jelly sandwiches are a staple on all my hikes or long driving days. They are filling, substantive, easy to make and carry, and delicious. They can also sub in as breakfast or dinner in a pinch. I love this post! A block of cheese never needs an explanation. Tis so beautiful…I will remember all the wonderful hints when I go camping…salt and pepper in a straw really caught my eye…yea you! !